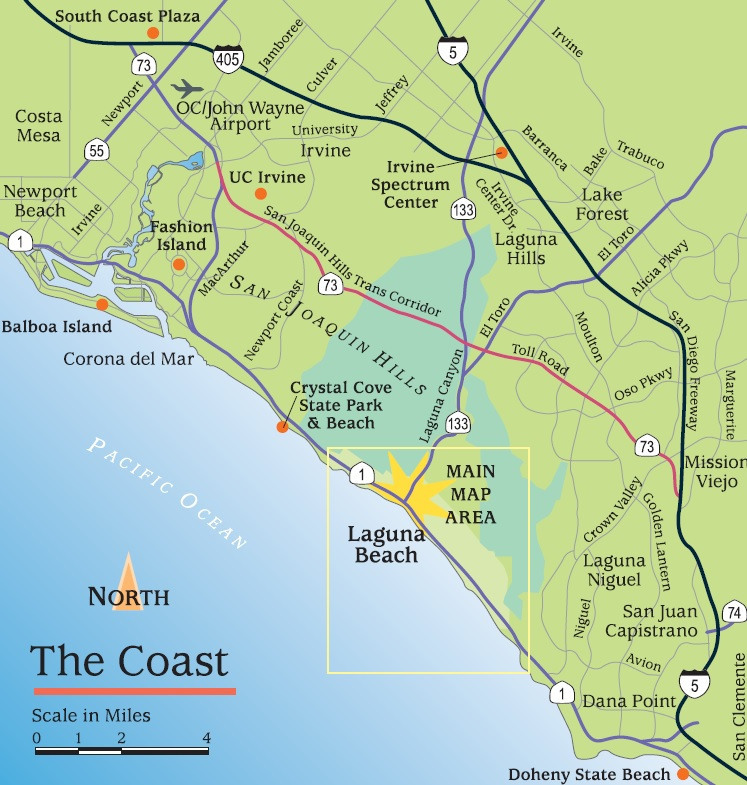 It's an easy drive from all directions to Laguna Beach. We're centrally located in Southern California. Check out a map of our location. If you have some time to enjoy the scenery, check out California's Pacific Coast Highway 1, which meanders along the ocean and brings you directly to Laguna Beach. We can't wait to see you in the OC! Take the 405 or 5 South, exit Hwy 133 South toward Laguna Beach. The 133 South turns into Laguna Canyon Road and becomes Broadway. Make a left on Beach Street - it will dead-end at Beach Street and Forest Avenue with the Visitors Center right in front of you at 381 Forest Avenue. Take the 405 or 5 North, exit Hwy 133 South toward Laguna Beach. The 133 South turns into Laguna Canyon Road and becomes Broadway. Make a left on Beach Street - it will dead-end at Beach Street and Forest Avenue with the Visitors Center right in front of you at 381 Forest Avenue. From the San Gabriel Valley, take the Orange (57) Freeway South to the San Diego (5) Freeway South. Exit Hwy 133 South toward Laguna Beach. The 133 South turns into Laguna Canyon Road and becomes Broadway. Make a left on Beach Street - it will dead-end at Beach Street and Forest Avenue with the Visitors Center right in front of you at 381 Forest Avenue. Enjoy everything Southern California has to offer by spending less time on the road with The Toll Roads. One-Time-Toll® is the ideal choice for out-of-town visitors and infrequent users of The Toll Roads. No account necessary - users drive the 73, 133, 241 or 261 Toll Roads anytime, day or night, then pay within 5 days after driving on The Toll Roads either online at thetollroads.com or by using The Toll Roads app. For more information, visit thetollroads.com.